Back in 2009, in a fit of frustration, I sent out a tweet suggesting that I didn’t want to perform any more wedding services for people under the age of 25. The resulting conversation led to this post which was eventually picked up in an edited form by the folks at the United Methodist Reporter. I don’t know if those posts had anything to do with it, but a few weeks ago I was asked to be a part of our annual conference’s Pastor Licensing School to teach on what folks need to think about in regards to doing weddings. Yesterday I headed up the mountain to Beersheba Springs and spent a couple of hours talking about the pastor’s role in the whole experience of Christian marriage. Certainly, there were many logistical details that we talked about, but I began the session unpacking the theology of Christian marriage and how the pastor understands his or her role in the American expressions of marriage. I noted that the American experience places pastors in a muddled roll, with one roll as a representative of societal expectations, another as a flack for the state, and the third (and I think the most important) as the mediator of God’s grace in this experience. Christian Marriage is a religious ceremony of worship through which husband and wife covenant celebrate God’s gift of one another, and make a covenant with each other, with God, and with the community of faith to form a relationship of mutual support, love, and fidelity. Christian Marriage is a means of grace, through which the Holy Spirit reveals something of the divine to all involved in the service – couple, participants, and ministers alike. While not an official sacrament under our teaching, it has a sacramental function by which God’s grace is given. As a means of grace, Christian Marriage is open to all persons who are seeking after God’s presence at some level in their lives. Understanding Christian Marriage as a means of grace suggests that pastors are given the opportunity to witness to the radical love of Jesus Christ to persons who may not be able to fully affirm their faith in Christ yet. 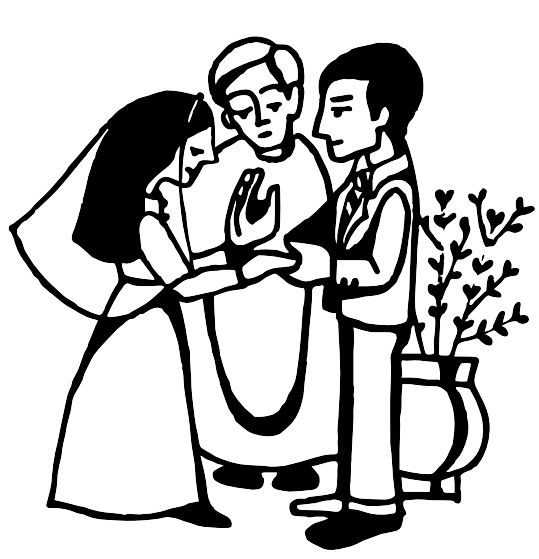 Likewise, as a means of grace, Christian Marriage offers an opportunity to witness to the love of Jesus Christ to other participants in the service as well, including attendants and the congregation. Represent the tradition of faith which has solemnized the establishing of covenant between marital partners for centuries. When desired by the couple, the pastor is able to serve as the representative of the state. However, Christian Marriage is predominantly a religious function, not a legal one. So, what do you think? What you you add or subtract in your own understanding of Christian Marriage? Click here to download a copy of that hand-out we used last night. As a no longer methodist who was never comfortable with the way the UMC views pastors as ontologically different than laity even when I worked for my UMC church, I would take issue with the idea that Gods grace needs a mediator in pastoral form. Point 5.1 I would strongly reject. Maybe point out the greaves of God to help people recognize it, but never mediate it as if the pastor is the only conduit God is using at that time to dispense grace. Frankly I consider this idea to be so off base as to be a bit obsene. Then again I always did think the umc denies the priesthood of all believers in practical fact even if they give it lip service. However having been badly hurt by the pastor at the UMC church I worked for I might be biased against UMC pastors in general, as I think the system made things a lot worse by allowing the pastor to get away with things because no one could call him on them. Keith, I am not suggesting (nor would ever suggest) that the pastor is the only source of God’s grace when it comes to the whole wedding thing. As a one who lives in the Wesleyan tradition, I believe in God’s prevenient grace which is given freely to all regardless of whether I am around or not. It may be that it would be better to suggest that the pastor serves as a conduit of God’s grace — not exclusively for sure — but as one means of many. However, given the pressures of what I call the “wedding industrial complex” to make weddings and marriages something very apart from one’s faith in God, there are very often times when the pastor is called to mediate (literally, stand in the middle according to Webster) between the things of God and societal pressures. This includes often being the sole voice in the drama that ensues around wedding planning reminding folks of the values of our faith, and helping to provide a context by which we understand this as a theological act rather than simply a social construct. Don’t get me wrong . . . I have no problem if one wants to say that marriage is simply a social construct, but let’s then not wrap it in the trappings of the church and somehow say that God is a part of it. Christian Marriage at its core requires that one understands it within a framework of God’s actions — or else it isn’t Christian Marriage. The pastor is usually the only person in our current milieu who is concerned with reminding folks of this framework, and thus is a mediator between the things of God and the voices in society suggesting that marriage is solely about the love between the couple. The pastor isn’t the only conduit of God’s grace, but in my experience with the way we do weddings in American, her or she is often a primary means of grace. In this, the pastor is a counter-cultural evangelist, challenging the assumptions of the wedding industrial complex to suggest that there are far more important concerns involved in the joining of two people in marriage. One other thing… the tension in Methodism between those who maintain a high priestly identity for the ordained versus the belief in the priesthood of all believers is very real. I tend to believe that those who hold to the “ontological difference” between clergy and lay do so more out of tradition than any theological reality. I will not deny there are some of my colleagues who believe in the separation, and think that somehow they look down on the laity from above, but I’m not one of them, and thank God there are more and more clergy who understand that our call is to servant leadership, which means that we walk beside and among, not above or separate. This isn’t to deny the reality of ascribed authority placed upon pastors by their congregations — very often I want to be less separate and the congregation members aren’t going for it. But I am neither the bible answer man, nor some sort of mystical connection to God. I’m just a guy trying to walk in the way of Jesus who, for some crazy reason that I don’t fully understand, God led to provide some leadership to local churches. I don’t have any special connection to God — in fact, there are probably folks in the church that I serve who are much more connected to God that I. My role is to stick my finger in the wind to try and discern where God is leading us, and then to point in that direction. Certainly, I don’t do that alone, but in a community of others who are also doing similar things. All I do is set the table for the conversation. Jay, I think this is a good list. The notion that a wedding is a worship service covers most of the issues you raise. In many ways, the issue of marriage is where we come most into conflict with the culture and when we find out where faith really stands in the eyes of the people of God. I think that what YOU think about a pastor’s role in marriage, frankly, doesn’t matter. God was and is in marriage without a pastor having to be involved at all. Do you REALLY believe the God of the Bible or do you lean on your own understanding? Have you ever studied why there is even a pastor at all Catholic’s instituted that, not God. There were MANY different ways to get married back then. God is WAY bigger than some guy that thinks his logical method is the ONLY way to get married and have God’s grace. Really………full of yourself much? Read Job for a while and then speak about how much YOU know about God.